Head coach of the South Africa women's senior national team, Bayana Bayana, Desiree Ellis is targeting a win against Nigeria in their opening game of the 2018 Africa Women's Nations Cup in Ghana. The two teams will face off in the first Group B match on November 18 and Ellis whose final squad of 21 was unveiled on Thursday by the South Africa Football Association (SAFA) spoke to the media in a news conference. "The first game of the AWCON is very important. Nigeria are the defending champions. They're not the champions for nothing but we want to win and concentrate on the other games," said Ellis. "But it's not just the Nigeria game but the other group games because we have to respect other teams. The competition involves the eight best teams on the continent. They will be equally tough," Ellis stressed. Team captain Janie Van Wyk added her voice as she spoke on the hard work and dedication shown by the players on the road to Ghana 2018. "It was really tough, every player really worked hard during the qualifiers. We can't wait to get started.
" I can't wait for the first game (Nigeria) because we want to start well." 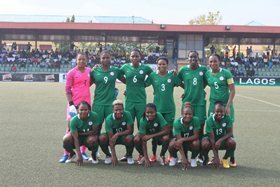 Nigeria remain the most successful women's team in the Africa Women's Nations Cup (AWCON) winning eight of the past ten editions.